Algeria’s president informed the country’s constitutional council Tuesday of his decision to stand down, state news agency APS has reported. The ailing 82-year-old resigns from the presidency following mass protests against his rule. He ruled for 20 years. 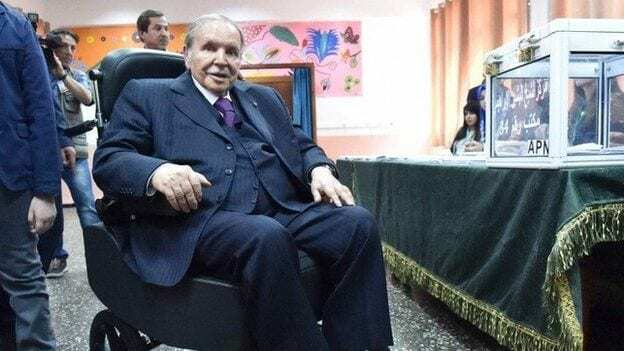 Abdelaziz Bouteflika’s resignation followed an aggressive call from the country’s defence ministry for the embattled president to quit “immediately” following weeks of street protests. The announcement followed army demand for impeachment proceedings against Bouteflika. After Bouteflika’s announcement, hundreds of jubilant people gathered in downtown Algiers on Tuesday night, singing songs and waving Algerian flags. Car horns sounded in the street as small crowds of people began gathering to celebrate. “We are confident in the ability of all Algerians to continue this democratic transition in the same spirit of calm and responsibility,” Le Drian said in a statement. The president suffered a stroke in 2013 and since then he has rarely been seen in public. He had been running the country from behind the scenes for 5 years, fighting several medical issues in the process. He was aided by a cabal of sympathisers known as Le Pouvoir.